The web can be a lonely place for content providers. Mostly you spend way too much time on whatever you'd like to share, then carefully upload it and send it out into the world. Silence. Without fanfare or further ado, you're on to the next task. When I hear for example "Davis Summer Morning July 7, 2013"
or "Davis Thunderstorm Sept. 2, 2013,"
*Dr. Hallberg's uploads to the 4'33" App, captured to date throughout Germany as well as in Sicily and Cuba, may be found under his pseudonym, PiTTo. The 4'33" App gives me a chance to travel -- without moving, without wasting time, no change of places, traveling by mind, leaving the body behind, concentrated on my hearing sense, not being distracted by the power of pictures, by night or by day. There are some Russian students on their way by train between Saint Petersburg and Moscow. I am with them. An old English Professor of History, Sir John Huxtable Elliott, lets me share moments of his private life in Spain and North Africa. I follow the Austrian composer Karlheinz Essel to Salzburg and Madeira, and, surprisingly, some days later, I meet him on the Isle of Rügen, where I physically was just days before. I join a young woman in her home in the middle of Russia (Tomsk), and then follow Charles Amirkhanian to San Francisco, where I've been twice, meeting him a moment later in Costa Rica, then at his stopover in Germany (Nürnberg), and finally in Sicily, where I later traveled and added recordings of my own. Now back home again in the middle of Deutschland, this App allows me to travel back again and again. And at the same time, I always know that other people can live together with me in every 4'33" recording, wherever I am or will be. This year I visited a small, fantastic Island, belonging to Cuba, called Cayo Coco. With the 4'33" App I am able to return there, whenever I want. When I will have left this globe, my friends, family, and others will be able to relive some special moments with me. It is very gratifying to read of Dr. Hallberg's enjoyment of the 4'33" App. I didn't anticipate the "aural travelogue" aspect when we first came up with the "World of 4'33"" idea, but it has become one of my favorite things. People have been taking photos of special places they visit since the camera was invented, but I think it is a relatively new idea to capture a sonic "portrait." The simple power of Cage's piece is that it calms the mind and focuses it on the sonic environment, putting a three-movement frame around the sound of a given time and place. Our 4'33" App has taken the "place" part of that equation and mapped it onto a browsable world, allowing "traveling by mind," as Dr. Hallberg so eloquently puts it, in a way that seems much more powerful than merely viewing pictures of some faraway land. I always thought of the 4'33" App as a sonic travelogue or sonic snapshot. Dr. Hallberg gets that completely. I was recently re-reading David Byrne's fantastic book, How Music Works (McSweeney's, 2012), and came upon the section where he discusses the struggle between ears and eyes for human perceptual dominance. He thinks the eyes have won. Dr. Hallberg's reference to "not being distracted by the power of pictures" brought that to mind. We have lost a lot by our dependence on the visual at the expense of the aural. I think Cage knew it back in 1952. 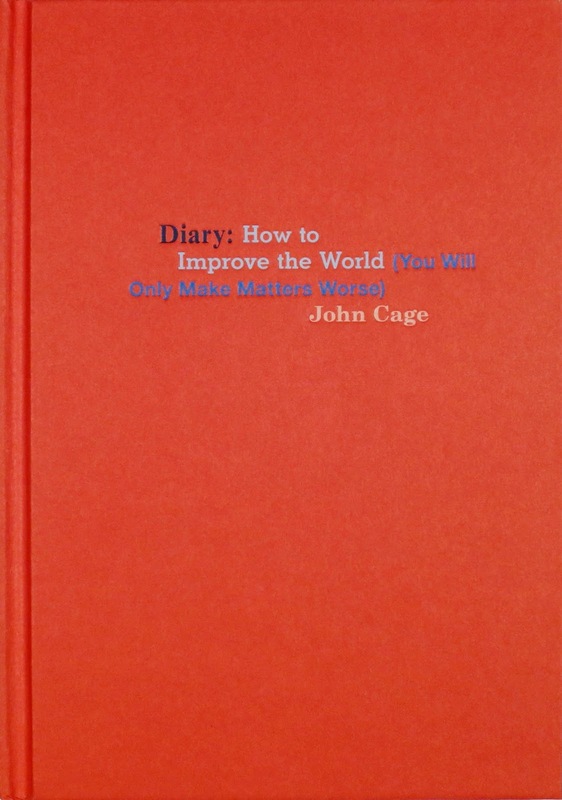 For the first time ever, all eight parts of Cage's Diary: How to Improve the World (You Will Only Make Matters Worse) will soon be available in a beautiful collected edition from Siglio Press, coedited by Joe Biel and Richard Kraft. 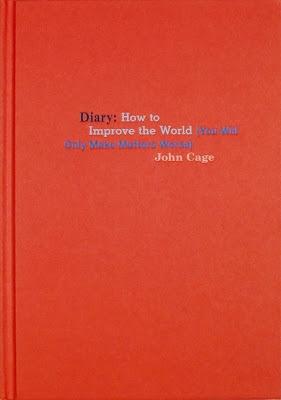 Composed over the course of sixteen years, Cage's Diary is both prescient and personal, a 16-year repository of observations, anecdotes, proclivities, obsessions, and stories that traverse territory ranging from the domestic minutiae of everyday life to ideas about how to feed the world. Cage typed his entries on an IBM Selectric, using chance to determine word count, typeface, number of letters per line, patterns of indentation, and (in the case of Part Three, published as a Great Bear Pamphlet by Something Else Press) color. In Siglio's hands the unusual visual variances on the page become almost musical as language takes on a physical and aural presence. Siglio is an independent press in Los Angeles dedicated to publishing uncommon books that live at the intersection of art and literature. Their publications are cross-disciplinary, hybrid works that subvert paradigms, defy categorization, and reveal unexpected connections. Siglio believes that challenging work can be immensely appealing, and that books are as much a pleasure to touch and hold as they are to read. 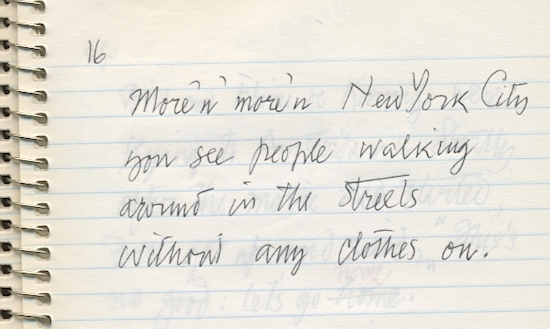 In every sense, John Cage's Diary finds itself perfectly at home. 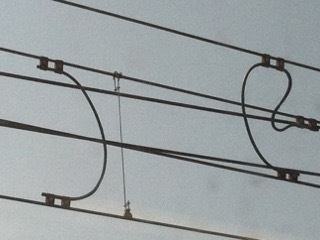 Ah, had John Cage lived to see this! 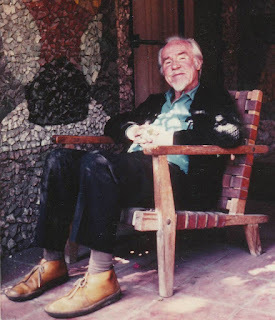 This really isn't a blog, as it's far too long (and lacking any bells and whistles), but it seemed the best way to publicly share a conversation that took place between John Cage and Conlon Nancarrow in Telluride, Colorado, in 1989. This was in the context of the Composer-to-Composer Institute that year, headed up by Charles Amirkhanian and John Lifton, involving, in addition to Cage and Nancarrow, Morton Subotnick, Joan La Barbara, Trimpin, Anthony Davis, Laurie Spiegel, and many others. Cage and Nancarrow hadn't seen each other in years. It's posted here today to coincide with the second week of the "Anywhere in Time: A Conlon Nancarrow Festival" taking place at the Whitney Museum of American Art in New York. Yesterday, co-curators Jay Sanders and Dominic Murcott hosted an afternoon comprising two events -- this recording (in an abbreviated version) enhancing a conversation between the two on the subject of Cage and Nancarrow, which was preceded by a spirited exchange between Murcott and Kyle Gann, author of The Music of Conlon Nancarrow (Cambridge University Press, 1996), on the subject of Nancarrow's amazing music for player pianos. Gann also maintains a Nancarrow Webpage, available here. This afternoon, in the same third floor space, Amirkhanian presented "Nancarrow Deconstructed." I've learned a tremendous amount from the proceedings, and have had a marvelous time watching a player piano very much like Nancarrow's own realize a number of his works. 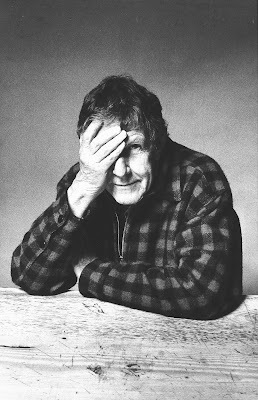 The recording from the John Cage Trust is available in its entirety here, which, because it's old and archival, is not the highest audio quality. To facilitate listening, I'm including a lengthy transcript of their conversation below. You can read as you listen if you like, which might make things inaudible a little more audible. Enjoy! CA: Since John and Conlon really didn't meet each other until much later in their composing careers -- John working on the West Coast, Conlon having gone to Spain with the Lincoln Brigade and then to Mexico -- it would interest me to know how you first met. Did you, Conlon, when you came back to the U.S.in '47 to build the punching machine, hear about John? CN: It was before that. John doesn't remember but I heard the first performance of his prepared piano. CN: The one in your apartment, remember? CN: Well, I don't know if you were living there but Minna Lederman told me to go there and gave me a sort of… It was a private thing, there was just a few people there. I remember Virgil Thomson was there, and a few other people. JC: Was that on the river? CN: I think so. It was in '39. JC: '39? Pardon me, but I wasn't there then. CN: Well, you had to be. In '39? Well, your piano was! CA: You were in Seattle then? JC: No, I was in San Francisco. JC: Seattle or San Francisco. 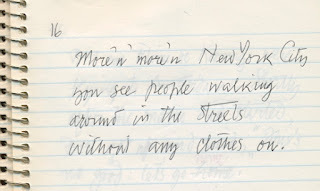 CA: When was the first trip to New York? '43? JC: When I left the West Coast I spent a year in Chicago, which was in the early '40s. It must have been '42, or '43, that I settled in New York for the first time. CA: You did the big concert at the Museum of Modern Art. JC: In '42, wasn't it? CA: Was it '42? So, I wonder when that was. It couldn't have been in '47? JC: It couldn't have been in '39. CN: No. Well, wait a minute. Could it have been? When was the first time you had anything with the prepared piano? JC: There are some people who think that the prepared piano wasn't made in '39. CA: That would be more likely. CN: Was that, do you think, probably the first time? It wasn't even public, it was sort of private I think. JC: No. I had done it on the West Coast. CA: In any case, Conlon, did you talk with John then? CN: Oh, no. He didn't know me. CA: What about you, John? When do you remember first encountering Conlon's music? JC: Well, my knowing of Conlon's work was through John Edmonds at the New York Public Library, who had tapes. CA: Reel-to-reel tapes. Was he an old friend of yours somehow? CN: Well, yes. I didn't know him too well, but, yes, he was a friend. JC: He thought I would be interested in the work and, as your work just makes us, you know, not just interested but excited, I was very glad to learn of it and, moreover, I wanted to use it in relation to Merce Cunningham's work. So we were just then planning a… When did I first come to see you in Mexico City? CN: Wasn't it when you went there with Merce Cunningham? Yes, we were planning a trip to South America. I think that was it. JC: …and Merce had already made a dance using your music. CN: But before that, though. It wasn't in Mexico that he used that music of mine. JC: No, but we had made it but I hadn't yet met you. It was exciting not only to have the music but the possibility of being with you in Mexico City. Not only for me but for David Tudor. CN: Oh, that's right. Yes. JC: And I remember the food that we ate together in your home, which included, didn't it, the huitlacoche? CN: Huitlacoche! The one mushroom that you didn't know. JC: It's a mushroom that grows on corn, and has the shape of corn but its own color. CN: Well, it's a fungus on the corn. CA: They throw it away in this country. CN: They do. You know, I don't think there's any word for that mushroom in any part of the world, in any other language, other than corn. It must appear but they must just throw it out, I'm sure, as a diseased ear or something. JC: We have a market, though, now, in Union Square, with organic food, and when the corn is organic, of course, it grows the mushroom so that it's possible in Union Square now to get it. CN: They grow it there? JC: They grow it organically, you see, in the area around New York and some of the farmers come to Union Square, and if you look through their corn you're apt to find huitlacoche. CN: But in Mexico, this corn is not organic. It's just the usual commercial corn. JC: Yes, I know, but it doesn't have pesticides. CN: Well, that's true. They don't put it on corn. JC: If you put pesticides on it the mushroom won't grow. So, it's possible to get it now in New York. CN: What do they call it there? JC: They have a bad name for it. CA: John, when you went into Conlon's studio and you were confronted with two pianos and the enormous sound of these pianos, was it completely different from listening to the tapes of Conlon's music? CN: Well, in the first place, those were very bad tapes. JC: …in which Satie goes to visit with Conlon Nancarrow in Mexico City and when Conlon puts on the piece for two player pianos, Satie is absolutely bowled over. CN: In fact he's attacked by the pianos! JC: Yes, he lies on the floor and the pianos are approaching him and in some amazing way they manage to pull themselves up instead of hurting him as they go over him, and he's delighted not only with the music but with the behavior of the pianos. And then he says he's going to write about it in the newspaper. The reason I put that in was because in one of Satie's texts -- in the Infantines -- the little boy, before he's going to sleep, asks his mother whether he's been a good boy or not. No! She says, "You’ve been a good boy today," and he says, "Will grandmother know?" And the mother says, "Yes, she'll know," and the little boy says, “How?” And the mother says,"In the newspaper. She'll read about it in the newspaper." CA: When you listen to Conlon's music, what is most apparent to you about it structurally? CA: Yes, we’re going to play that. That's the Third String Quartet. JC: …the word canon comes up, all the time. CN: Well, practically all my music is canons. JC: Well, that’s what's… What did you ask me, Charles? JC: Yes. In other words, for the purposes of this conversation, I’d like to know how you came to discover the canon. It's clearly very important for you. It's useful, isn't it? CN: Well, more than that. Not strict canon but the imitation of one voice and so forth. CA: For instruments, or just player pianos? CN: …even though it's in another key or whatever, than if it's a completely different thing. You get not confused but it's not as clear as when this one and this one’s doing this way. It’s the same thing. That's the main reason I got more obsessed with the canon. CA: Conlon, what about other composers who've used canonic procedures that you might have been interested in? Were there others? CN: Oh, well, of course. Bach, all of the people of that period used canon quite a bit. JC: I think what you say now, though, makes it very clear, that in the complex polytempo situation that you were working in, this what you can call obvious relationship, of two different things, makes a very clear, makes a musical object that you can perceive. Then you can begin, after having that problem solved, so to speak, you can then begin to listen. CA: You know, the other day John was talking to me and the subject of Bach and Mozart came up and you told me that you felt more aesthetically aligned to Mozart than Bach. Why is that? JC: Because of his tendency toward multiplicity, whereas Bach has a tendency toward unity. Do you agree with that, or not? CN: Yes, well, in fact, I didn't read it, but Julio Estrada told me about something he read once about Einstein, who said, I don't know, someone asked him about Bach and Mozart, and he said, "The universe should be like Bach, but it is like Mozart." CA: Could you elaborate a bit on your ideas about Mozart? JC: I think I've already stated it, with the multiplicity. But I think that if Mozart were living now, he would use the technology and so forth to make his music even more rich in differences than it is, whereas Bach probably would continue writing his own music. CN: Of course, Mozart might be doing rock now. JC: Oh! You know, besides, Conlon and I come from a period, the '30s and the '40s, particularly in the '30s, in which the world of music seemed to be limited by the work of Stravinsky and Schoenberg. Wouldn't you agree? JC: They stood out, like the mountains stand out. How did you feel about that? CN: Well, actually, you know, Schoenberg and dodecaphony never appealed to me, aesthetically or musically. JC: This is very interesting, because it appealed very much to me. CN: Really? I didn't know that. JC: I made a choice. When I saw that there were these two mountains, I chose Schoenberg. Whereas I wasn't aware from you… But you found Stravinsky more interesting? CN: Yes, for my own particular aesthetics you might say. JC: Did you ever have a conversation with Stravinsky? CN: Oh, no. I wouldn't have dreamed of it! (laughter). JC: I'd like to say a little bit about how my feeling was about the two of them. I lived in Los Angeles and both Stravinsky and Schoenberg were living there and I had elected to study with Schoenberg. And Merle Armitage… Did you ever hear his name? CN: I know the name. CA: And a brilliant book designer. CN: It was an insult. JC: …and that he should somehow take it back. Of course he didn't. Later, however, in New York, many years later, there was a performance of L'Histoire du Soldat, and I was given the part of the Devil. And Elliott Carter was given the part of the Soldier, and, it must have been Aaron… No. I don't know who was the Narrator, but it may have been Lukas Foss, or Lukas was conducting. I'm not clear about that. Anyway, I had practiced the part of the Devil as much as I could. Stravinsky was in the audience and he was pleased with my performance. I changed my voice -- I didn't become a parrot (reference to John Lifton's vocal antics), but I became "other." And so Stravinsky asked me to come and see him in his hotel, which I did, and we had a brief conversation and in the course of it I made clear to him that I had chosen Schoenberg instead of him and he said, "Why?" And I said because his music was chromatic, because it used all twelve tones. And Stravinsky said very gently, almost plaintively, he said, "But my music is chromatic too." And then he added, "The reason I never liked Schoenberg's work," he said, "was because it isn't modern." And that struck me, because then I remembered my two years of study with Schoenberg in which Schoenberg would say, speaking of four notes, and generally they were the same four notes, C-D-F-E-D-C, he would say, "Bach did this with these notes, and Beethoven did this, and Brahms did this, and Schoenberg did this." In other words, he considered himself part and parcel of the tradition, whereas Stravinsky thought of himself as separate from it, and in a sense that could be described with the word modern, or it could be separated from the notion of maintaining tradition. You would accept that, wouldn't you? JC: The notion of separating. You wouldn't? JC: But don't you think your devotion to the canon exceeds the devotion of tradition of the canon? JC: I mean your music is really distinguished. CN: You mean it's traditional? JC: No, distinguished from tradition. CN: Oh, distinguished from. Well, for other reasons. As you say, the canon's been around for a long time. JC: But your devotion to it is very special. CN: Well, I guess the use I make of it is different from most people. CA: But wouldn't you say that Bach did a canon this way, and so-and-so this way, and Nancarrow this way? CA: So you are part of the tradition. CN: No, into a common denominator, actually. What does he call it? Tempo modulation? JC: Yes. In other words, he combines it with other ideas that come from the traditional. Whereas, if I may so, your use of the canon is starkly different. CN: I guess so, yes. JC: It's very strongly apparent as different than what we have known of canons before. CA: I think it would be appropriate to, since you brought up Elliott Carter's name and since Carter has used this technique in order to enable performers to play in temporally different relationships, to listen to Conlon's Third String Quartet now, because that is an attempt by Conlon to pull back from irrational rhythm relationships that can't possibly be played to find the limits of what human performers can do. The recording that we have by the Arditti String Quartet was made at the world premiere in, I guess, '88? CA: Could you say just a few words about it? John, would like to say something? JC: I don't think that what you said… You're not moving toward the limits of something, are you? Aren't you just… I mean, say you came to a limit, there would be then, the possibility would develop, of going beyond it or not. The ability of musicians to play your music has changed from finding it impossible to finding it possible. JC: But if you continue to work with the Arditti Quartet, or similar situations, you'll find, I'm sure, that things that we think are impossible are not impossible. CN: That's true. Of course, they're unique. I don't think there's any string quartet in the world that can approach them. But the limitations there… This Quartet is polytempo, but rational tempos. I can't imagine any human performers performing, accurately, these irrational relationships. There's just no way of coordinating, none. This Quartet, at least, has measures. I mean, the musicians, if they're very good, as the Arditti is, can handle it. CA: Yes. What are the tempo relationships in this piece? CA: Yes, in what we are going to hear. CA: In each of three movements? CA: And is it always the violin in three, the second violin in four…? CN: No, no. Each movement is a separate canon. I mean, it's the same tempo through the whole Quartet, that relationship, including the final, accelerated canon, at the end, the final coda, where one instrument starts in, the other voice at one percentage, and it's answered by the next one, the same voice, at another tempo, 'til finally they all come together right at the end. JC: Then what you mean is that even the Arditti could not do 61 against 60? CN: Not because of… It would just simply be too… Yes. I think that I mentioned last night, it's not a 60 against 61, it's a speed against another speed. And for someone to play accurately… Say, if the other musician is playing with the metronome set at 60 and the other to play, without metronome of course, at 61, the beat or whatever. I don't think it's possible. CA: This piece is about eleven or twelve minutes long, and I think it's time for us to listen. JC: I find my pleasure in hearing that music is not in my knowing that it's a canon. CN: Well, it doesn't depend on that. JC: No. It gets into an openly mysterious situation, so that I'm listening, so to speak, wherever I can listen. CA: Vertically rather than horizontally? JC: In all the corners. CA: John asked me earlier today if you would say something about your work habits when you're in the process of composing. How do you go about it? JC: Very simple things, Conlon. Like do you like to work early in the morning or late at night? CN: Well, my habits have changed over the years. At one time I was working most of the time, either reading or working. JC: And you work also early in the morning? CN: No. Before? You're talking about before? Now there's a sort of standard life. No, before, I would work usually very late at night and then get up early but then sleep most of the afternoon and go back to work at night. How does your system go? CN: Excuse me. You told me not too long ago that you did most of your composing in airplanes. JC: I did? Now I do most of my sleeping there. No, I’m joking. When I was younger my energy was with me from the moment I woke up so that I could work more or less in the morning and work through the day. But I never liked to work at night. CN: Yes, of course. Everyone has a sort of daily rhythm of, well, energy, and all kinds of things. And it varies with different people: if you’ve more energy in the morning, some in the afternoon, some in the night. It really varies. JC: But the other thing is, did you make all those rolls? Did you actually do the work, which, in my case, corresponds to, say, copying music? I now have a copyist. Did you have someone to punch thing? CN: I should say not. JC: You did all the punching? CN: All of it. Of course, people have suggested I could maybe teach someone to punch but I have to be there watching every note anyhow so what’s the difference? JC: You still do that? CN: I still do it. That’s the part that’s the hardest work. CA: When you’re punching, you’re not exactly copying from the score? You must make an adjustment of some sort? CN: Oh, no. When I punch, I have what I call a punching score, which is something no one else could read – sort of shorthand. I mean, I write the piece on paper, on manuscript paper. CA: But it’s not legible to another person? CN: Well, sort of. It takes quite a bit of deciphering. I use that to punch and then, later, and also when I do that I correct maybe some mistakes I made in my own printing of that, and, after that, I make a legible score that people can read. So it's a whole process, quite long. JC: It must be amazingly time consuming. CN: Oh, it is. Some of those rolls are quite long and take six or eight months just punching. CA: What happens if you had made a mistake in a roll? You put it in the piano and play it and realize something desperately is wrong. CN: No, look. Say I punch a wrong note, then I just put scotch tape over it and punch the right one. Once in awhile, I think only once that happened, I forget what happened… But a big section was all wrong. I had to punch that whole section again. But the problem was splicing it back into the roll. It was a whole operation, but it worked. JC: …doesn't have any ideas? I think it's true that each person has, so to speak, his work in life to do and that mine has come to consist in asking questions rather than in making choices. I had an experience when I was studying with Schoenberg. It was a class in harmony, at UCLA. I studied with him both in his home and first at USC and then at UCLA. This was a class in harmony, but he was giving us a problem in counterpoint, in the class. There were about thirty people in the class. And he sent us all to the blackboard, and gave us the problem with the cantus firmus, which I've already mentioned, to which he was always faithful -- he never let us use another one -- and he gave a problem, and he said, "When you have it solved, turn around, put up your hand and let me see it." So I did that and he looked at it and he said, "That's correct, now another," another solution to the same problem. And I did that. And others were meanwhile doing the same thing. There came the time, after about eight solutions of the problem, when it occurred to me that there weren't any more solutions. So when he said, "Now another," I took courage and said, "There aren't any more solutions." And he said, "That's also correct." Then he said something which made me love him more -- or admire is a better word, or worship -- he said, "What is the principle underlying all of the solutions?" And I couldn't answer. I just remained silent, I didn't have anything to say. But now I would say -- and I think he would agree, I think he would say "That's correct" again. I would say that the question you ask underlies all of the solutions. CN: When he asked you that and you said you didn't know did he say what that would be? JC: No, no. He would never have done that. And I didn't say I didn't know. I just remained silent. I had nothing to say. He would never have answered for me. He said another marvelous thing, in another class, which determined me to devote my life to music. He said, "My purpose in teaching you," and he was speaking to forty or fifty people at USC, he said, "My purpose in teaching you is to make it impossible for you to write music." And, still worshipping him, I decided to prove that he was wrong. CN: I'm sure other people there did too. JC: Yes. It was best teaching he could give us. CA: I wonder if we have questions now from the audience? Yes, there's a person in back. **: I was curious about last night, when Study No. 37 was played last night just on wooden shoes. How did you find listening to the canons just in a rhythmic context rather than with pitches? CN: Well, naturally it was more limited, because it's the pure rhythm, nothing else. What defines a canon is not only the rhythm, but the melodic structure of it, so it's another version of it. Naturally someone listening to that, who doesn't know the canon -- never heard it. It could be sort of meaningless. I don't know. **: In some places in the piece I found it actually a little easier to follow the canon. CA: Because of the spatial relationships you found it easier? Of the shoes? CN: Well, that's possible. Yes, maybe. As a matter of fact, a canon would be, even with the pitches, I think because it has twelve voices, all in a different tempo, would be much more accessible to the ear if it could be… Well, Trimpin is planning to do something about arranging it for different sounds for the different voices. CA: Not just wooden shoes but different timbral instruments. CA: Any other questions? Yes. **: I have two questions. One's for Conlon, which is a follow-up to Laurie's (Laurie Spiegel) question, which is, where, for you, does the boundary between noise and music fall? And the second one is for John, which is: I've noticed that even though you're using chance operations, there seems always to be a point where you are making decisions, you're saying "I want it to have so many instruments," or "I want it to have…." Why have you chosen not to go the full distance with chance operations? Maybe I'm wrong, but it appears that way. JC: You mean I should answer that? CA: Why don't you answer that? JC: I don't know what you mean by the full distance. You see, I'm involved in what, in Zen, is called purposeful purposelessness. I'm not involved in purposelessness. CN: No, I don't think there's for me a sharp dividing line between as you say noise and music. Noise can be made into music and vice versa. Does that answer it? John, you taught us all about silence, and I'd thought about coming here and showing you how well I can do that. JC: You mean not say anything? CN: Yes. But then I thought that's a little exaggerated. CA: There's a question here, in the front. **: Some questions to the first section of your speaking: There was no (mention of the) name of Henry Cowell, and both of you had contact with Henry Cowell in the '30s, is that right? John, you subscribed to New Music Series, or not, and Conlon, you had an edition of this New Music Series, in the '30s, so you must have known this music a little bit earlier? CN: Well, for me, I think John knew him. I never knew him, but his book, the New Musical Resources, was I suppose one of the major influences I had in my music. The book. **: But how did you get this edition? CA: How was your music published by Cowell? CN: Oh. As a matter of fact, I think when it was published he was already in jail. When I went to Spain, I left some scores that I'd been working on with Slonimsky (Nicolas Slonimsky) and he gave them, I guess, to Cowell, or sent them to New Music. I don't remember. They published them. They published them when I was there. I didn't even know about it. So, you answer your part of that, John. CA: About your relationship to Cowell. JC: Well, it was a very lively influence, the book and, for me, also his classes at the New School. CA: When were those classes, John? **: That was in the '40s? CA: So you were in New York in the '30s. JC: Yes. But I had not yet made the prepared piano. CA: The prepared piano was in '38. JC: Or '39, or '40. At any rate, it was after my work with Henry Cowell. One of the things in my experience was to hold the pedal down so that Henry would go around to the back of the piano to strum the strings, you know, and so forth, in The Banshee. CA: But there was, to answer your question, a major influence that conjoins these two gentlemen. A question in the front row. **: Sixty years later. Who would you see the peaks as, and who would you study with today? JC: I think I would study with James Tenney. The reason I say that is that all my life I've… Well, when I left Schoenberg, I left him because he demanded a sense of harmony, a feeling for harmony, and I had none. And he could see that from my work, that I had no feeling for harmony. And I simply didn't like that kind of control that harmony had. I could do it, but I couldn't do it with any enjoyment. I could do it correctly, but not with any imagination. But it was last December, in Miami at New Music America, that a piece of James Tenney's was performed, and he has spoken and taught a new attitude toward harmony which I think, for him, comes through his study of the work of Varese. And that piece began without the audience's knowing that it had begun. We thought that the musicians were just fooling around, or rather tuning, which is… That they weren't really serious about what they were doing, you know. And it began with the accordion, that very fine accordionist, what's his name? JC: Yes. And shortly I realized that we were hearing the piece. That the audience was not listening but the piece had begun. So I noticed that the music began with a sort of unison and then it became microtonal and it went on and on until finally, as the intervals grew larger, it stretched to the extremes of the instrumental capacities and it was all in relation to a different theory of harmony than any that I knew. It suggests to me that harmony could be different for each piece. That each piece, and I'm inventing this now, and haven't studied it, but I think that one could make a music in which each piece would have its own harmony. CN: Well, I think if you describe harmony, sounds that you hear at the same time… Well, that's not really what you call harmony. I mean, look. Almost anything that's more than one sound sounds at the same time. JC: True. But I don't have any feeling for that. JC: But I think Tenney does have a feeling for it. CN: Well, he has a feeling for the… Well, you call it harmony. I don't. JC: Well, he calls it harmony. CN: I didn't know that. JC: No, he calls it harmony. He's very insistent about it. CA: In any case, would you study with Tenney in this situation that was just proposed? CN: Possibly. I never thought of it. I admire Tenney very much. JC: I wouldn't mind studying with you either. CA: A question, right here. **: I was thinking about your reaction to Anthony Davis yesterday and I was thinking that your early works -- First Construction and Imaginary Landscape -- are aggressive music. And I was thinking that if the separation you felt from Anthony Davis is possibly because he reminds you of yourself as a young John Cage. JC: I would like to say, and I think I've already said it, not now, but at earlier meetings -- that this week, for me, has been characterized by a difficulty with Anthony Davis at the beginning and now no difficulty. So… By no difficulty I mean I can even listen to the ideas he expresses and try to understand them. Whereas when he first expressed them this week, I resisted hearing them. I didn't even want to hear them because I don't enjoy that kind of concern with power. I want a situation, I'll try to avoid the word anarchy, but I want a situation in which each person is at his own center and not only the people but the things. This is a Buddhist idea. CA: There is, John, a kind of contradiction in wanting to be a modernist and a recognized artist who is an individual and an individualist, in the context of both your political ideas, Conlon, that tended toward Socialist-Communist ideas, and yours, John, which tended toward Futurist-Anarchist, in which everybody has what they need. And the world situation now is that in Capitalist societies, the gap between those who have what they need and those who don't is widening, and in Socialist societies, there is an economic breakdown which is brought about by isolation which the Capitalist societies impose upon them, but in fact is now being trumpeted widely by the American press. Right in the face of the situation we have here. In Japan, where Capitalism is working very smoothly, there is a kind of conformity that is necessitated by the geographic location, and by the cultural history. And I wonder how you think about the idea of being an individual and somebody very different from the masses in that you create something new, viz a viz your wanting everybody to have at least the minimum of what they need. Did you, Conlon, for instance, when you were active politically, come under attack by people who were politically allied with you for your music? CN: No. Why would they? I don't understand. CA: Because they might have said you were elitist. CN: Elitist?! Well, it wasn't very elitist. I wasn't earning any money at it. CA: So what was your incentive? That's how Gorbachev is going to solve his problems, by incentive. CN: That's a bit more complicated, to say the least. CA: Any thoughts on that, John? JC: I haven't had any. JC: What is the question? CA: If you're an individualist, how can you propose that everybody be more or less equal in the way society treats them? CN: Well, he wants everyone to be an equal individual. JC: I would like each person to have what he needs. And I think if we used intelligence instead of politics, if somehow we saw the world situation that we're in as a problem that needed solution, and if we put our minds to solving it, that we could, with our technology, we could, and Bucky Fuller had this view. We could do it. We could make life, as Bucky used to say, a success for everyone. And we could live, for instance, not in places that we owned, but in places that we used. We already do that when we go on vacation. So we could make the world a continual vacation. CA: Well, I'd like to spend half of mine in Telluride. CA: There's a question over here. **: I have a question that's similar to what Charles was asking. The other day you, John Cage, were talking about a conductor-less orchestra as a leaderless society -- less government. Has that proposed any personal dilemnas, for you, in, for instance, in accepting N.E.A. grants? Any compromises in your existence and contact with governments for art, paying taxes…? JC: No. We're living in a transition, if we get to the place we're transitting. So that we live in a state of inconsistency. It's only reasonable. We can't have just one idea now. We have to be inconsistent. **: And has that inconsistency influenced you creatively? JC: Yes. I would say it's a principle now. CA: There's a question very far back. ideas that you’re disappointed, that you feel have not been fully or properly explored yet, or ground that you see that you don’t think you’ve explored yet? JC: I think there are more things to be done now, more things to explore than ever, and that this… I don't even know what the unknown is. CA: But you know it's there. JC: Right. I'm not a student, for instance, of all the computer possibilities that are going to be discussed later today. I wouldn't know where to begin, but I'm sure the field is fascinating, enormous, and so forth. CA: Any ideas, Conlon, on things you wish you'd gone into? CN: No. The thing I mentioned the other day, which, I think, for the future, is very important, the Global Village, but not how McLuhan thought of it. Now the Global Village is that only a half a dozen people are running the world. JC: But that wouldn't be… Well. How do we know? CN: We don't, but we see it coming. JC: I was going to say we don't know whether it would be good or bad. CN: Oh, you seem to think that if there's this dictatorship up there that you agree with, then it's good. Is that the idea? JC: No. I would want it to be intelligent. CN: Oh, it would be very disorganized, no doubt about that. JC: I would like, for example, the environment to be handled in such a way that it wasn't destroyed, as we're doing now. CN: Yes. Well, of course. CA: And that's being done by both Socialist and Capitalist societies. CN: By the whole world. CA: But what you're saying, John, is that Nationalism is worse than five corporations? JC: I think there's a great deal of unnecessary competition in almost all departments where there should be problem-solving instead of competition. CA: And you don't want the five corporations or the fifteen hundred nations. CA: There's a question in the back. **: I'd like to backtrack a little bit and make a comment, first, that what I've noticed in hearing both of you speak is that you have a common interest, in, John, with your notion of chance operations, and, Conlon, with your polytempos. That the center of activity is with the individual, to a very large extent. CA: To the listener, do you mean, or to the performer? **: To the performer. That there's a tremendous emphasis on plurality within a piece. In other words, that each performer is generating a lot of energy towards the piece rather than the emphasis being the central unifying element. I'm wondering if what I'm saying is really accurate and that is in fact what draws you to each other. Have I been clear? CA: …as regards the similarities between your music? CN: No. He's mulling it over. JC: I'm not getting very far. CA: Let's take one more question. JC: …I think I live in a world with you in it. And I don't have to be drawn any closer than we actually are. CA: There's one more question here. **: This is a question for John Cage. You mentioned, almost in passing yesterday, that your views on improvisation in music have changed -- you're less critical, I take it, than you used to be. Could you talk about that some? JC: I would still criticize improvisation as I used to criticize it, but now I think we can imagine an improvisation which is different, different from just doing what you want. And much more like improvisation as Anthony Davis seems to think it or do it, that is to say, he thinks of improvisation as giving the improvisers a problem to solve, and that's how I find it acceptable, too. That if you can give people freedom in a situation that they see as a problem then the solutions can be invigorating. But if improvisation is not seen as a problem, then you just get repetition of mannerisms, or you get more of what you already know that you like. And what we want is to extend our enjoyment of life, or extend our enjoyment of music, of relationships of sounds. We want to live, don't we, in a more Mozartean situation? Or as Mozartean as we can get? And richer. Various. CA: Before we conclude we have an announcement that John Lifton and Pam Zoline would like to make. Please join us. JL: Last year, at the first "Composer-to-Composer," we gave an award that was invented on the occasion for Lou Harrison, called "In Tune with The World" award, and we would like, on this occasion, of having Conlon Nancarrow and John Cage here, to give them corresponding awards. We're not quite sure "In Tune With the World" is the right title here. Conlon's should be "In Time with The World" and John's should be called "Chance Encounters with The World." Anyway, we are so privileged and honored to have had them here with us this year and would like to thank them very much for coming and this is a little gift from us from Telluride for them to take back with them.